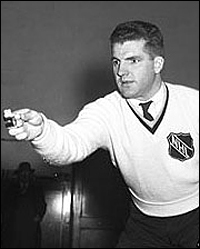 The hockey world remembers Bill Chadwick as the one-eyed referee who made it to the Hockey Hall of Fame and invented and developed the system of officials’ hand signals that are now used around the world. But many New Yorkers, myself most definitely included, will remember Chadwick as “The Big Whistle”, a beloved broadcaster who often mangled names, yes, but nonetheless delighted thousands of fans with his trademark calls and phrases both on radio and television for 14 seasons from 1967 to 1981. Bill Chadwick, who won the respect of the hockey world as a ref, could entertain friends for hours with remarkable stories from his Hall of Fame officiating career. I was there, home and away, for all those years. Despite a 25-year age difference, Chadwick and I became the closest of friends. Our wives did the same. “Chadwickisms,” I called them, and there were many others: “He skates like a cat in a marble hallway,” or “These guys are running around like ‘Singers Midgets,’” the latter a reference to a long-gone vaudeville act. Chadwick’s broadcasting career, five years on radio with ace play-by- play man Marv Albert and nine more years on television with peerless Jim Gordon, is recalled with great fondness by Ranger fans of all ages. Fans often mimicked his trademarks, not in derision, but with respect and humor. Even Albert and Gordon, consummate broadcast professionals, adapted their personal styles to Chadwick. One of Chadwick’s favorite names to mis-pronounce was that of Reggie Leach of the Philadelphia Flyers. Bill insisted on calling him “LEASH” instead of “LEACH”, and each time he said it, thousands of dogs in the Metropolitan Area would presumably respond by jumping up for a walk. In the 1970s, the success of the Madison Square Garden Network gave Chadwick and Gordon a national audience of transplanted New Yorkers. A Bill Chadwick Fan Club sprung up in Hawaii. Once, the fans even came to Los Angeles to greet Chadwick and Gordon. Chadwick’s nickname, “The Big Whistle” owed its birth to Arthur Friedman, the Rangers’ long-time statistician, who had a great penchant for tagging hockey players and hockey lines (G-A-G Line, T-A-G Line, etc.) with colorful monikers. “It was really a no-brainer,” Friedman recalled. “I mean, Bill had done so much as an official, and it just popped into my head one day. ... The Big Whistle.” Albert, Gordon, and long-time radio color man Sal Messina picked up the name ... and ran with it. Chadwick loved the nickname so much so that he entitled his 1974 autobiography just that: The Big Whistle (Hawthorn Books with Hal Bock). That friendship extended to many of their colleagues, myself happily included, but also the producers, directors and technicians who worked the telecasts. Gordon and Chadwick made it a point, following games, to visit the control room and thank the men who helped get them on the air. Over time, we developed a coterie, a traveling band of brothers that included “behind-the-scenes” guys such as Jack Simon, Herb Kaplan, John Calabrese, Joe O’Rourke, and Bobby Lewis. We met regularly over beers on the road, and at the center of it all was “The Big Whistle,” regaling us with endless stories and filling the nights with laughter. Chadwick was also a great boon to the Rangers’ public relations efforts, constantly appearing at functions to spread the hockey gospel. One of the groups Chadwick and I took a great fondness to was the New York City Police Department. That fondness eventually led to a high-spirited friendship with two of the top cops in New York, leaders in fact, of the Patrolmen’s Benevolent Association. The two cops, both genial and collegial, were huge Ranger fans, and HATED the Islanders. In 1975, the Rangers were involved in a three-game playoff with the Islanders. The teams split the first two games. Game three was at the Garden on April 11. The city was in a hockey frenzy, nobody more so than the two cops. Did it ever happen? No. Could it have happened? You bet. All that was needed was a nod from Chadwick or one of his cadre. Will there ever be another Bill Chadwick? Of course not. I’m just glad I was along for the ride the first time around.